We want to be fully transparent with readers, so we want you to know that when we discuss products/services on this website, when possible we will use affiliate links. If you follow our affiliate link to StudioPress for example, and go on to purchase that product or service, we will be paid a small commission, however the cost to your will never be higher than what you would normally pay. 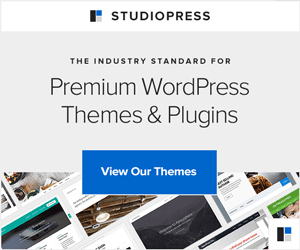 We have used StudioPress Themes and the Genesis Framework exclusively to build websites for clients since 2011, so we absolutely stand behind StudioPress products. Affiliate links are one of the ways we get paid for our work. If you find the information on WPStudioWorks to be useful, we would appreciate your support by using the affiliate links on the site rather than going directly to the source. Thanks in advance!